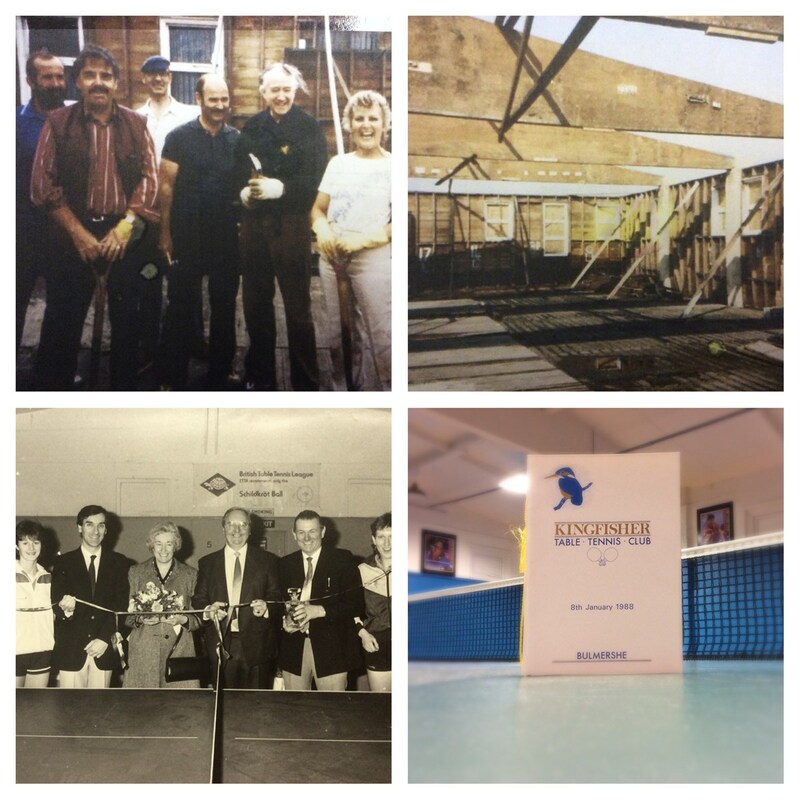 Kingfisher was created from a partnership of the Omega and Woodley Table Tennis Clubs in the mid 1980s. 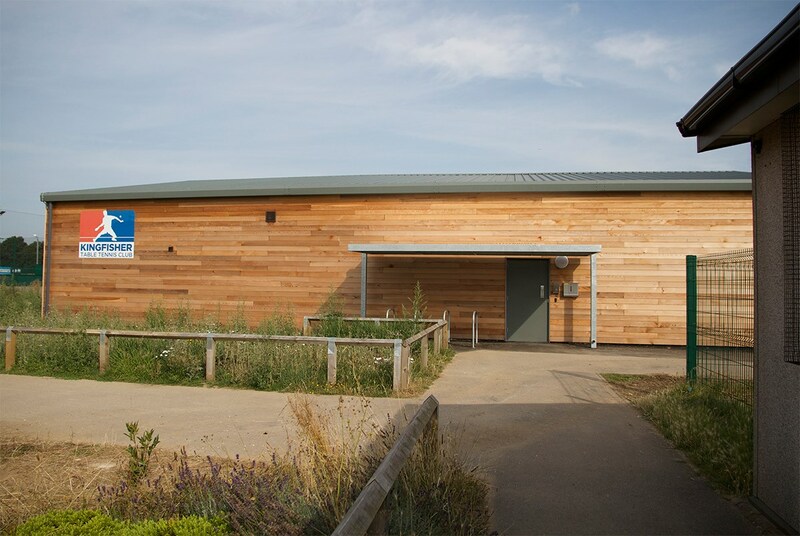 Omega had to vacate their premises in Green Road, Reading due to house building plans but the then Berkshire County Council Property Office granted the Omega Club a 20-year lease on a piece of grassland on the Bulmershe School site. Omega had already purchased a pre-war wooden school building that was being dismantled in Sonning Common. This building, bit by bit, had been transported to Green Road. Omega’s problems started when it was realised that a club with only fifteen playing members (all juniors) did not have the manpower, apart from a few willing parents, to complete the task of erecting the building on the Bulmershe School site. With old friends John Fenton and Jim Hodder, the latter being a member of both clubs, acting as go-betweens, an historic meeting was set up between the Chairman of Omega, Peter Charters and his opposite number at Woodley, Mike Bullock. At this meeting it was agreed to join forces to create a new club which would embrace the two differing table tennis philosophies; Omega’s concentration on youth development and Woodley’s provision of table tennis for all. The thriving Woodley Club had long sought premises of their own having been resident in the main hall at Rivermead Woodley Secondary school. With the additional Woodley Club manpower and under the direction of Jim Hodder the new club building rose from the floor level achieved by Omega. Omega’s principle that all players would have their own key to the premises was continued by Kingfisher. The name Kingfisher was arrived at because the new committee did not want a specific geographical location in the title; there was a Kingfisher Drive nearby and it is an attractive bird with few nasty habits. A huge amount of work resulted in the first Kingfisher Club building being completed. A grand opening ceremony in 1988 was attended by former World Table Tennis Champion Johnny Leach and the new MP for Wokingham, John Redwood. Peter Charters was the new club's first Chairman, to be succeeded for the next 21-years by Brian Halliday. Brian had been an active member of the Omega Committee and had suggested that the club invest in an old school building being dismantled close to his home in Sonning Common. The influence of old Woodley Club was strong in the new Kingfisher Club committee including Colin as Kingfisher's first Secretary and John Fenton as President. John Witt, father of Karen, was Kingfisher's first Treasurer. Colin Dyke inherited the Chairmanship from Brian in 2009. In 2013 the club were informed that the building would be demolished to make way for the new Bulmershe 6th Form complex. It was agreed that a new building would be provided elsewhere on the campus and in May 2014 the old building was demolished and the club moved into it's current premises adjacent to Goals Soccer Center on Woodlands Avenue. 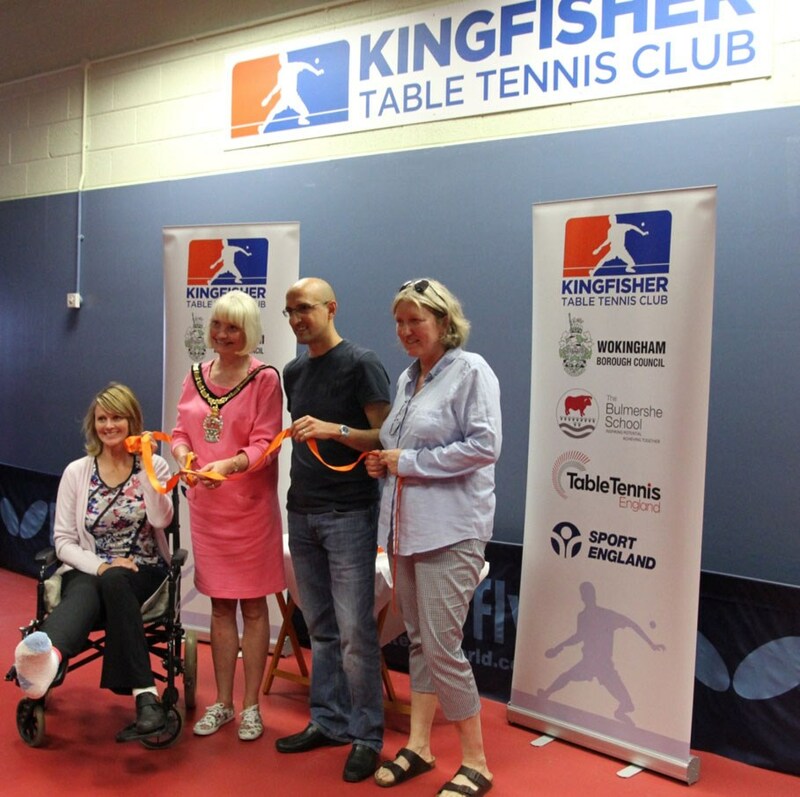 A grand opening ceremony was held in June, 2014 with guest of honour and Kingfisher member Matthew Syed, and opened by Councillor UllaKarin Clark, Wokingham Borough Mayor. A list of our past and present club officers and posts held can be found here. Today, the club is a rarity in table tennis; a purpose built facility totally committed to the sport with members holding a key to the door. It provides members with a practice and competition facility and allows for generous coaching time.